A couple of months ago I got a message from my friend Moshe Katz, founder of Israeli Krav International. He said he was putting out another book; an anthology of his blogs from 2010. 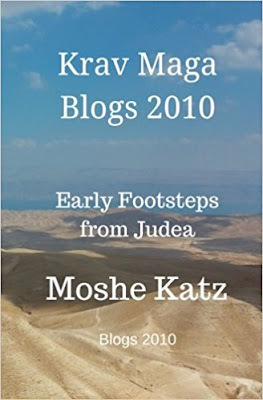 It's called Early Footsteps From Judea: Krav Maga Blogs 2010. He asked me if he could include one of my old blogs, as well as write the introduction. I was honored to be asked to contribute and agreed to both of his requests. Below is what I wrote for the introduction. If you're wondering about the rest of the book including which of my blog posts he used, well, you'll have to pick up a copy to find that out! It was a crisp winter day in Northern Michigan, Moshe Katz was speaking to a group of concerned individuals who came to learn how to feel safer, more powerful in their world. People who wanted to have a better understanding of why there are those out there who seem to want to spread fear, hate, and violence upon anyone who doesn’t believe in the same way that they do. A reality that the citizens of Israel are all too accustom, a reality that the people of the United States are beginning to wake up to. One person politely asked Moshe his opinion regarding whether or not the Middle East would ever be at peace. A question that has been asked by many others over the course of time, ranging not in weeks, months or years, but spanning decades, centuries and millennium. The answer that Moshe gave surprised me. Not only because of its simplicity and honesty. Not just because of its truth. But, also because of my relationship with Moshe. I don’t think the Moshe Katz that I first met some ten years ago, would have given the same answer as the Moshe standing there before the crowd on that snowy day. A decade ago, Moshe was just starting a new organization, Israeli Krav International (IKI). His mission began simply to teach people how to defend themselves as well as act as a goodwill ambassador for Israel and more specifically for Jews. His goal was to help people to defend themselves, and not live in fear. He did this by simplifying an approach that was accessible to everyone regardless of their limitations, age or athletic ability. and to share stories that inspired and taught. In his pursuit to accomplish this, Moshe travels the world sharing his vision and in doing so, he faces challenges to his own views and opens himself up to people and cultures with opposing beliefs that are sometimes much different from his own. Over this time I have seen him learn to embrace humanity with a more open heart and rather than fixate on our differences, focus more on that which connects us: Our humanity and our desire to protect. I’ve seen a change in Moshe that can only come from confronting one’s own way of thinking by exposing yourself to the world and its people. A change that is earned not given. A change that if embraced can leverage much greater things than merely teaching self-defense… No, not the same Moshe from ten years ago. Moshe’s approach to Krav Maga, much like Judaism, is steeped in magnificent stories. Simple tales easily communicated to people from all walks of life. Stories that point to deeper truths. Stories that teach, protect and inspire. I remember reading his blog posts for the first time and wondering if the person who wrote them was anything like the words written on the screen in front of me. He shared his thoughts and insights very candidly, giving his unique perspective of the world he travels and of course, his Krav Maga. Now you have the ability to read those very stories right here in this book, to enjoy and learn from. I believe his stories as well as his art comes from his sincere desire to share accessible tools to help everyone live a safer life. A life not necessarily free from fear, but rather one that has embraced fear and chooses to continue on in spite of it. It has been exciting to not only witness, but also participate in the dynamic growth of IKI as well as Moshe, both as a teacher and as a person. What began as an outreach mainly to college campuses has developed into an international organization spanning well over 30 countries, hundreds of instructors and thousands of students worldwide. His dedication to the belief that everyone has the right to defend themselves comes through in the accessibility of what he teaches as well as his profound insights written on the pages you are about to read. And now I hope you enjoy sharing in the insightful stories that Moshe Katz has for you in this book! If you cannot control yourself, you cannot control the situation, it’s that cut and dry. Here's an exercise for you. 1) What really pushes your buttons? 2) What things are you afraid of? 3) What makes you feel uncomfortable? 4) What takes you outside of your comfort zone? Identify these things inside of yourself, understand what they feel like, identify them and try not to let whatever that is have control over you. If you can name it, you can start to understand when you’re getting out of balance. It doesn't mean that things won't effect you, just that you are aware when you are off and can adjust accordingly. The whole idea of this practice is to work for balance. If you strive for balance this is going to be more beneficial for you. The balance between yourself and others begins with YOU being in balance inside of yourself. If something bothers you and you respond too gung ho, meaning that you’re too assertive, you can be too aggressive. This can sometimes cause trouble. It can also be detrimental to be too gun shy; being too hesitant, too passive, you let people breach your boundaries, saying to them, “oh, it doesn’t really matter,” but knowing deep down inside that it does. What happens is passive people often become passive aggressive people, they have boundaries that are not stated and when breached one too many times this type of person can begin to resist in a non-direct way. If you let a bad situation go too long, it can end up blowing up in your face, so we want to strive for balance between extremes. So, think about yourself and where you are on this spectrum. Are you too gung ho or are you too gun shy? If you’re too gun shy, you have to be mindful of it. If you’re too gung ho you have to be mindful of that as well. The better you can gain and maintain balance, the easier it is to see when things are out of balance within and around you! Almost anyone will defend themselves if they are in what is perceived as a life or death situation. Insults can easily provoke rage. Protecting family members from threat or attack. Protecting your own territory or home, which are basic needs of survival. Violence is often used to obtain or protect a mate. 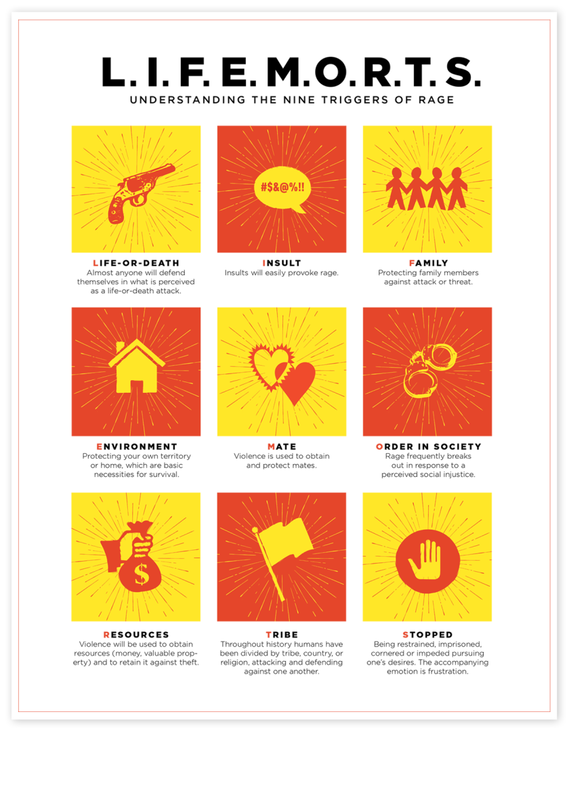 Rage frequently breaks out in response to perceived social injustice. Violence can be used to obtain and protect resources (money, valuables, property). In group / out group mentality. Throughout history humans have been divided by tribe, country, religion, etc. attacking and defending against one another. Being restrained, imprisoned, cornered, or impeded pursuing ones desires. The accompanying emotion is frustration. Not to mention hormonal (both naturally or drug induced). We could also add mentally unstable, chemically imbalanced, head injuries, hurt or perceived vulnerability, under the influence of drugs or alcohol. Anyway, I haven't read the book, but someone (Tim W.) forwarded me the Why We Snap pdf and I thought it was worth posting. The last article I wrote was titled “Building the DT Toolbox” and in it I suggested that when training recruits or novice police officers, an instructor’s primary focus should be to build their student’s “toolbox.” I then stated that the toolbox will be the “foundation upon which everything else will be built.” Notice that I didn’t state that the defensive toolbox will be the foundation upon which all other defensive tactics training will be built … No, it’s the foundation for everything. Many of the issues that police departments are having can be traced back to the quality of their DT program. Deescalation is a hot topic in policing nowadays. It seems that every time I turn around I hear something about new deescalation training or strategy for police officers. I don’t know a single police officer who is not in favor of making any bad situation a not-so-bad situation. 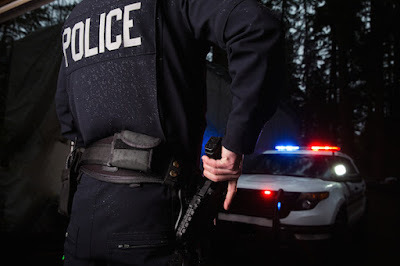 If there was a button that officers could push to make a suspect willingly comply, trust me when I tell you that every single officer would gladly push that button on every encounter. However, no such button exists. There are some really good deescalation techniques that officers are trained on. I personally like Verbal Judo. I find that I use it on a daily basis with much success. It works for me but it doesn’t work for everyone. Why is that? Why are other officers who are using the same technique often not successful in deescalation? Why are police departments beefing up their department’s deescalation training only to see it fail? The answer is simple: You show me a department whose officers are failing at deescalation and I will show you a department whose DT program is failing its officers. 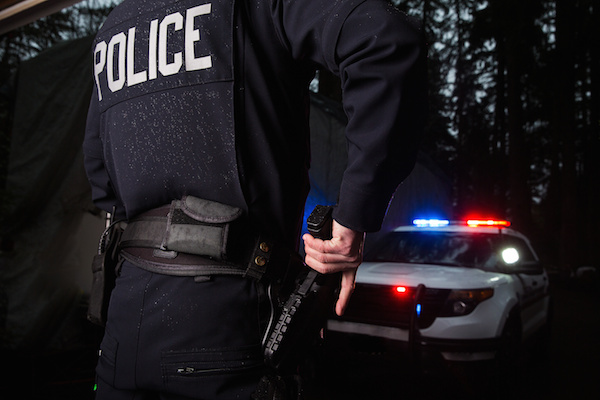 If an officer isn’t confident in the practicality of the defensive tactics that they’ve been taught, nor confident in their ability in the practical application of said tactics, this officer will now be operating out of FEAR. Operating out of fear will guarantee the failure of any other hands-off deescalation tactics that they have been taught. Said officer may have short-term success when deescalating bad situations. But it’s only a matter of time before someone calls their bluff. Hardened criminals can smell the fear and sense weakness. They can read an officer like a book. I say this from direct experience. Let’s focus on worst-case scenario for now. Picture this: We have an officer who is operating out of fear. The officer is dealing with a hardened criminal and the criminal has just called his bluff. The officer has exhausted all efforts for verbal deescalation. There is now only one route to take for this officer: ESCALATION. Let’s stop here. We all know what happens next. Realistic defensive tactics training is the foundation upon which all deescalation training will be built. This foundation must be strong in order to support the structure that a police department is attempting to build. It’s often forgotten that defensive tactics is the ultimate deescalation technique. It’s the last line of defense in preventing an encounter from becoming deadly. The confidence it houses in a police officer becomes their first line of defense in making their verbal deescalation tactics successful. First, if you haven’t already, please take a moment read my previous column. Next, start applying its principles! Once you’ve done your inventory and have your DT toolbox in place, drill your recruits/officers repeatedly on each of your techniques. When devising your high-stress drills, start with the worst-case scenario drill where the end result is deadly force. Once your students have mastered that, begin to add deescalation to your drills. For example, at the end of the technique, when your attacker is no longer fighting and it’s safe to do so, have the students disengage from the attacker and create space. From there, have them draw their weapons and begin giving verbal commands to the attacker. Once they have mastered that, devise a drill that has the student create space and draw their tasers or other less-than-lethal options with verbal commands. Once they have mastered that, have the students transition from fighting to control holds and take downs, and then onto handcuffing. Start with the worst-case scenario and work backward, slowly adding less aggressive forms of deescalation to the drills. Once your officers have mastered these steps, now it’s time to focus on communication skills and other “hands off” deescalation techniques. Thank you for what you do, and I hope this helps. Heath Jones is a 5-year police officer in Austin, Texas. He has been a Krav Maga Defensive Tactics instructor for the last 12 years, training police and military worldwide. Jones is currently assigned to patrol.